It’s a big year for The Main Street Youth Theatre. It actually began as The Hilton Head Community and Youth Theater in the early ’90s until 2006 when the name was officially changed to The Main Street Youth Theatre. Productions were originally staged at the community playhouse, located on Dunnigans Alley, as well as at Hilton Head Prep. It was founded with a goal to create a family-centered community-based theater where the performers are local children, parents and community adults. The mission included an objective to educate young local performers in all aspects of the theater, and to encourage family involvement in this activity. By exposing youth to a true theatrical experience, the Main Street Youth Theatre would provide an avenue to increase their self-esteem as well as enlighten and educate them through the power of live performance. Twenty years later, with over 50 production credits, that goal and mission remains intact. With 2017 bringing this milestone anniversary, its board members have been charged with creating a celebration that will include past alumni and current cast members. “The Main Street Youth Theatre has had such a positive impact on so many young lives,” board chairperson Cinda Seamon said. “So many alumni remain involved in some aspect of theater whether community-based or otherwise, and we have numerous alumni that have gone on to embrace the arts as a career. Either way, the theater has left a positive mark, and we have so much to celebrate.” The widespread impact has been with adults as well. From parents of the young thespians to volunteers as well as board members, countless hours and endless encouragement have been invested. Many adults have played key roles in the success of the organization; one in particular whose legacy continues and is given special honor this year is Judy Gallagher. Judy’s love of theater and, in particular the Main Street Youth Theatre, was evident in the numerous productions she performed in as well as her dedication to the organization off the stage. She had a passion and a joy seeing our area youth pouring their hearts into every production and wanted to see that continue long into the future. Her contribution has been significant and no twentieth anniversary celebration would be complete without a special thank you to Judy. The 2018 season promises to bring an even more exciting line-up for our youth. The current board is dedicated to maintaining the goals and mission of the theater and looks forward to providing stellar theatrical experiences to many generations to come. 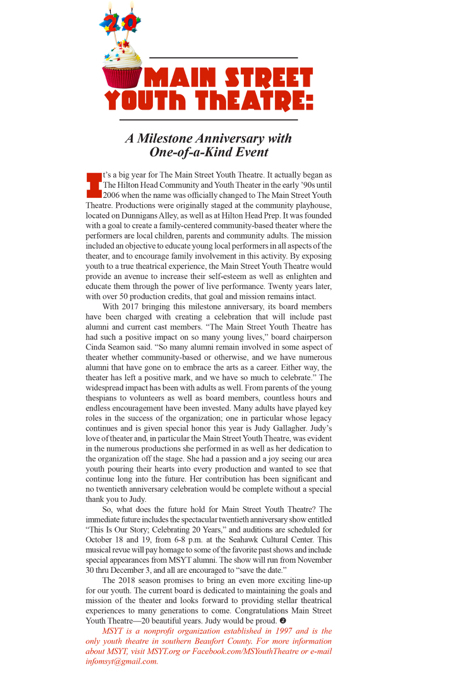 Congratulations Main Street Youth Theatre—20 beautiful years. Judy would be proud. MSYT is a nonprofit organization established in 1997 and is the only youth theatre in southern Beaufort County. For more information about MSYT, visit MSYT.org or Facebook.com/MSYouthTheatre or e-mail infomsyt@gmail.com.